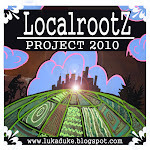 Localrootz Project: Garden Plot July 10. The community garden plot is coming along nicely this year and we have spent lots of time making sure there are no weeds popping up and keeping it well maintained. Bug damage has been minimal so far and the tomatoes and actually everything else seems to be getting stronger every day. Looking a little tight but that just makes us eat more kale and add it to every meal at this point in the game ! Lettuce varieties are just sizing up and Ill probably grab a head or two this week. Flowers are blooming and hopefully calling some bees over their way to get a bit more pollination of the tomatoes and eggplant ! Onions are bouncing back and looking strong too ! Tomatoes are caged and fingers are crossed that the recent blight sighting in Maine will not make its way towards our little guys ! Thinned out the kale and filled a basket with a mixture of Winterbore (Curly) and Lacinato (Tuscan) varieties along with another big bunch of Sage that I've been drying and packing in a jar. Even our kitty, Merrimac loves kale and always asks for her share when we get home from the garden ! Will update the progress of the rooftop garden in the days to come !